Known as both Hawaii's Suntanned Irishman and Tucson's answer to Don Ho, Ernie Menehune entertained dinner-club circuit audiences mostly in Arizona and Nevada and was a beloved part of Tucson's musical landscape for more than three decades. Among many writings about Ernie, there is a wonderful piece you can read in the Phoenix New Times by Peter Gilstrap, and an obituary right here in the Tucson Weekly. 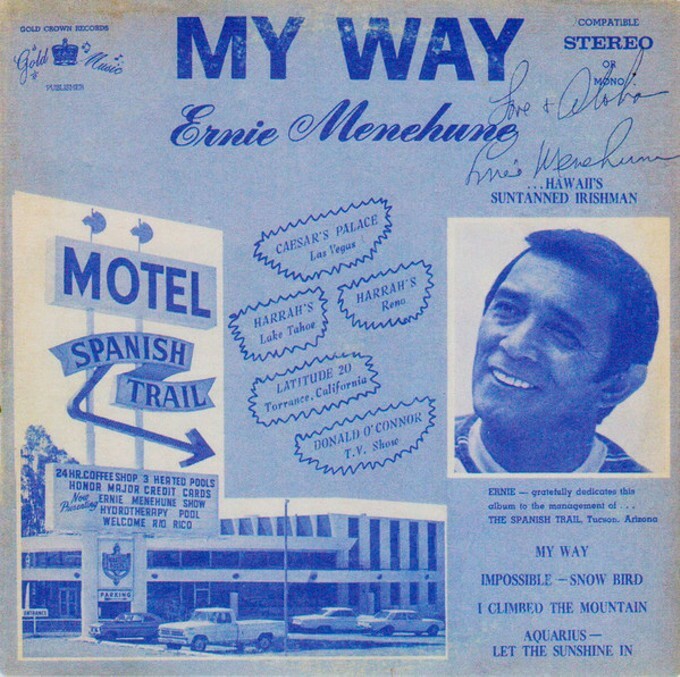 Recorded at Tucson's Copper State Studio, "My Way" features Ernie's cover of the Sinatra staple and a mixture of Top 40 hits such as "Sweet Caroline" and the then always present "Aquarius—Let the Sunshine In." Among the musicians backing Ernie up on "My Way," was former Dearly Beloved guitarist Tom Walker on bass, which he picked up specifically to join Ernie and crew for some Vegas gigs at the suggestion of a friend who was playing guitar with the dinner show. Per the album jacket, "Ernie gratefully dedicates this album to the management of the Spanish Trail, Tucson, Arizona." The former motel and supper club which featured more than 200 deluxe rooms and a lagoon hosted Ernie, as well as performers such as Duke Ellington, Frank Sinatra Jr., Count Basie, Freddie Martin, Rusty Warrren, Nancy Wilson and others. Many movie stars hung out at the Spanish Trail while they were visiting the town or shooting a film at Old Tucson. The once prestigious Spanish Trail now lies in decaying ruins, sadly greeting all heading into Tucson via the west side of Interstate 10.